Mott developed the Sigma Flex™ system to answer the industry’s increasing demand for flexible and adaptable laboratory space. Our customers can begin with the choice of a support structure from our wide range of island and wall cores, countertop uprights, single core frames, or wall rails. 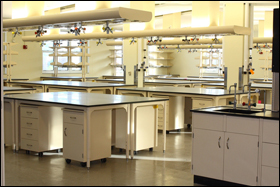 The next step is to design and build a custom laboratory by adding suspended casework, mobile and fixed cabinets, and shelving. All adjustable components are designed to be easily repositioned in 1″ increments for ultimate flexibility. Integrate electrical, data and service fixtures vertically or horizontally or add one of our overhead service carriers to bring the services from above. 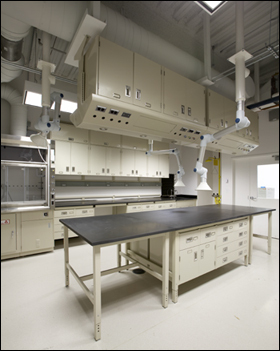 Many other custom options allow the creation of an optimal laboratory that can be reconfigured for the needs of the future with minimal down time through the use of basic skills and without special tools. Mott offers the Optima™ Laboratory Bench System to adapt to an array of laboratory processes, equipment, and users. It conveniently supplies all the services and features required for today’s laboratory in a self-contained bench assembly. 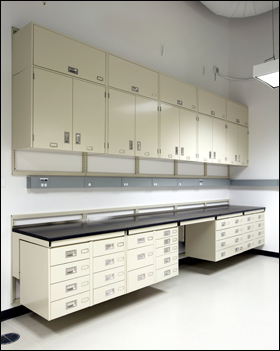 Using this system, laboratories can be easily created and reconfigures for new applications or changing workspace. Plumbing, electrical and data services can be factory installed to quick connect to ceiling mounted service panels or overhead service carriers. This stylish system is available in different designs and manufactured of either powder coated steel or stainless steel. Overhead Service Carriers provide the ultimate service flexibility by allowing for access to services, such as electrical, data, telephone, local exhaust systems, lighting, and plumbing services, throughout the lab. Overhead service carriers can be suspended or flush mounted from the ceiling and are available in several configurations. Optional factory installed pre-wiring and pre-plumbing are available to reduce installation time on-site.